As the ancient Seal of Solomon slowly fades over millennia, more denizens of the Invisible World slip onto the world of Man. Only the gifted ranks of Witch Hunters, divinely touched mortals that stand against the forces of the Adversary, are equipped to face terrors beyond human understanding. 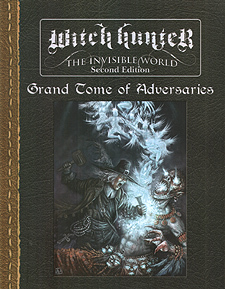 This invaluable guide to the fearsome monsters of the Invisible World provides everything needed by Grand masters to challenge cadres of intrepid Witch Hunters with the foulest minions of the Adversary. Dozens of Horrific Monsters to Power a Thousand Nightmares! New Monstrous Powers and Villainous Talents to Bring Forth Thousands More Fiends From the Invisible World! Advice on How to Put the Fear of the Adversary into the Witch Hunters!